We slept in till about 8:00 a.m. on Saturday morning, which was so nice. We were both hungry so we quickly put on some workout clothes and headed down for breakfast. 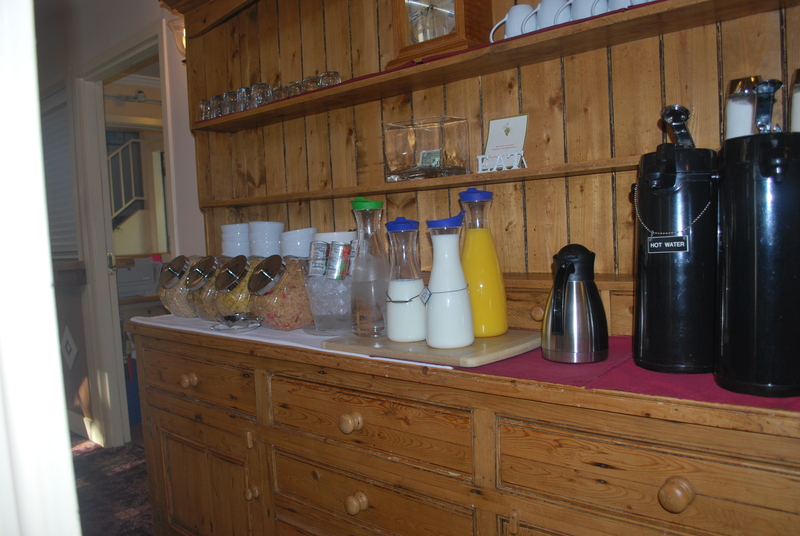 The breakfast offered was an extended continental style breakfast but it definitely exceeded our expectations. We came down to warm poppy seed and almond muffins right out of the oven, fresh fruit, yogurt parfaits, and of course hot coffee. 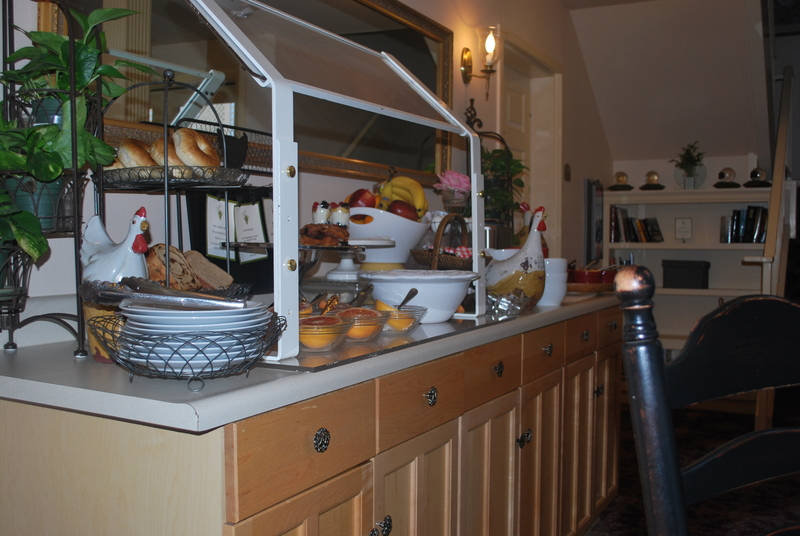 They also offered hard boiled eggs, fresh waffles made to order, and an oatmeal bar with everything you can imagine to pile on top. Overall we were among the younger crown in the hotel and around Napa but it was fun to be an adult (minus a baby) for this trip. There weren’t any kids screaming or running around, which was definitely not something we were used to so we enjoyed the quietness. After breakfast we went back to the room to get ready and finish mapping out our day with the Napa bike Tour. 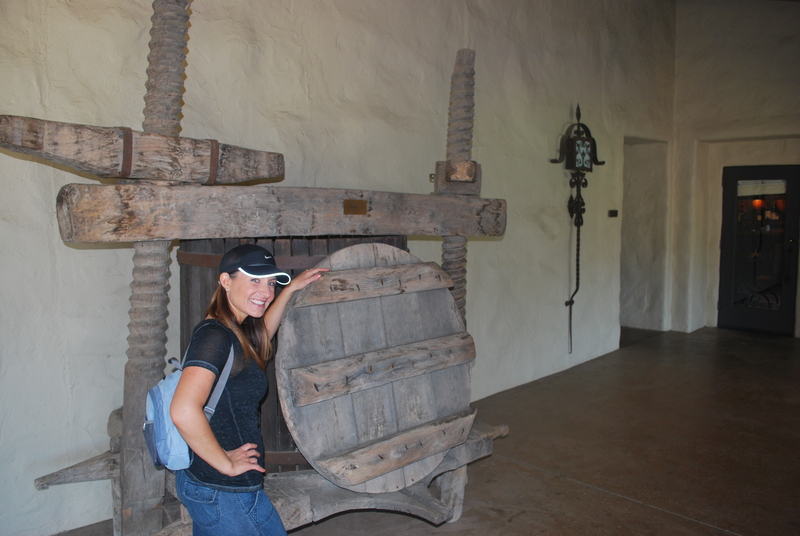 I chose a self-guided tour so we could go at our own pace without having to wait for others at the different wineries. 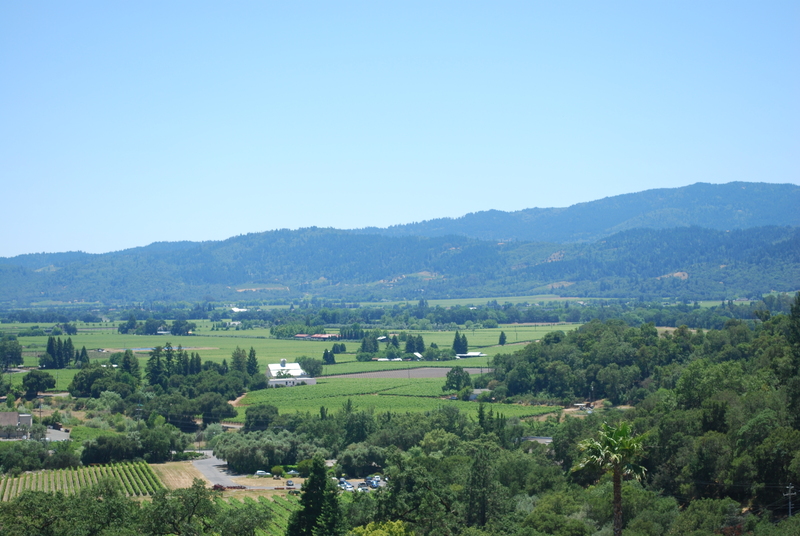 It was recommended to choose 2 wineries in the morning, stop for lunch at a winery (they suggested) with picnic tables, and finish off the afternoon with 1 last stop for a total of 4 wineries. 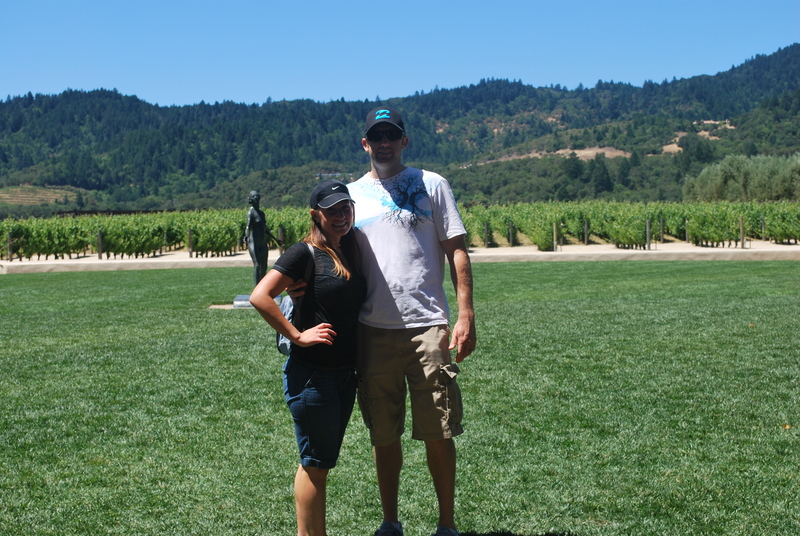 We planned a 16 mile bike tour which included – Robert Mondavi, Cake Bread Cellars, Rutherford Hill Winery (with picnic lunch stop), and Mumm Napa. 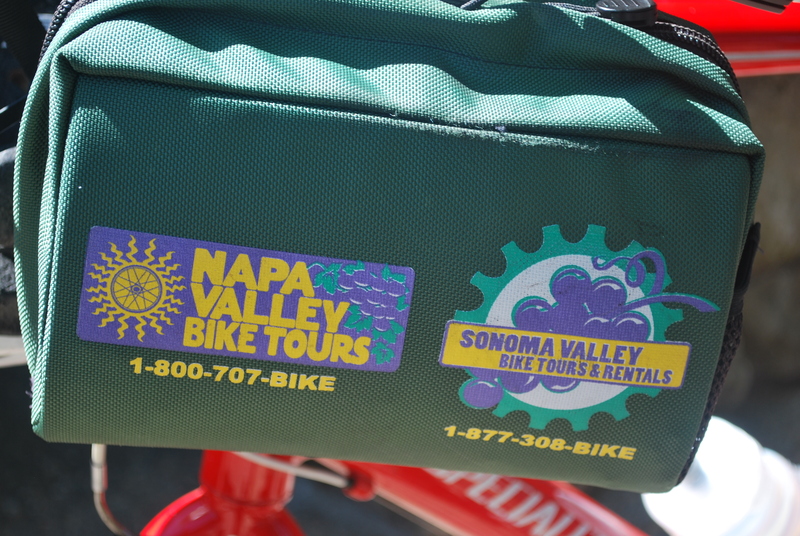 Napa Bike Tour Company was just a few miles north of our hotel. Along with us we brought a small backpack with sunscreen, snacks, camera, phones, ID’s, and credit cards. 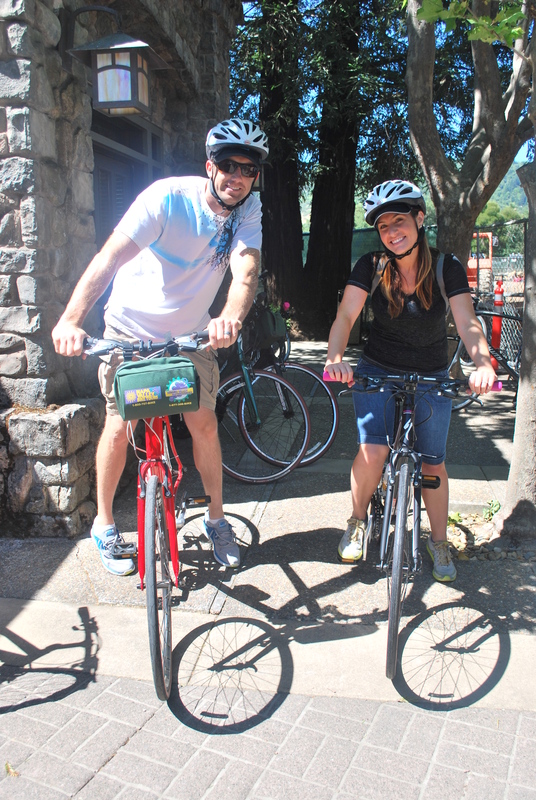 The tour provided a bike and helmet, souvenir water bottle with water, picnic lunch with our choice of sandwich or salad and sides, and they threw in a few protein bars for the road. 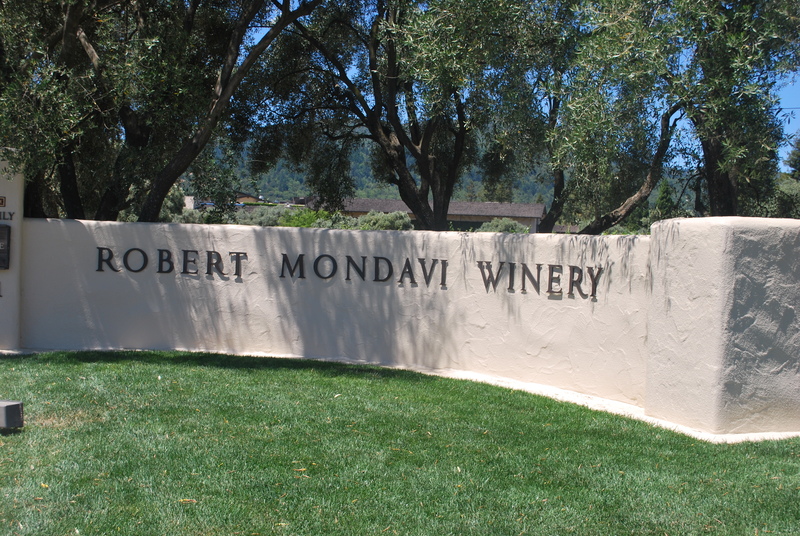 Our first stop was Robert Mondavi, and as a side note we highly recommend if you actually do bring kids to Napa to go here because of the large grass area out front. 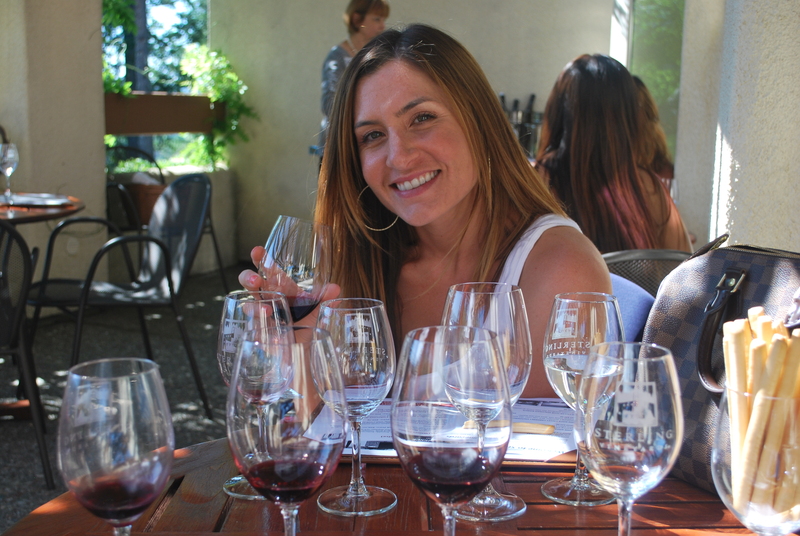 We tried 4 different Cabernet Sauvignon’s and a Pinot Noir in their reserve tasting room. 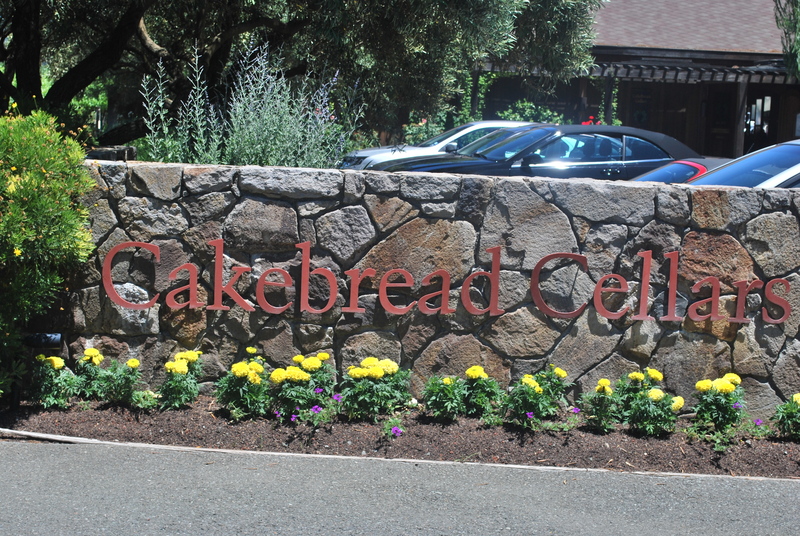 Next up was Cakebread Cellars, the only place I was able to make an appointment at (in fact, they only take appointments for tastings). 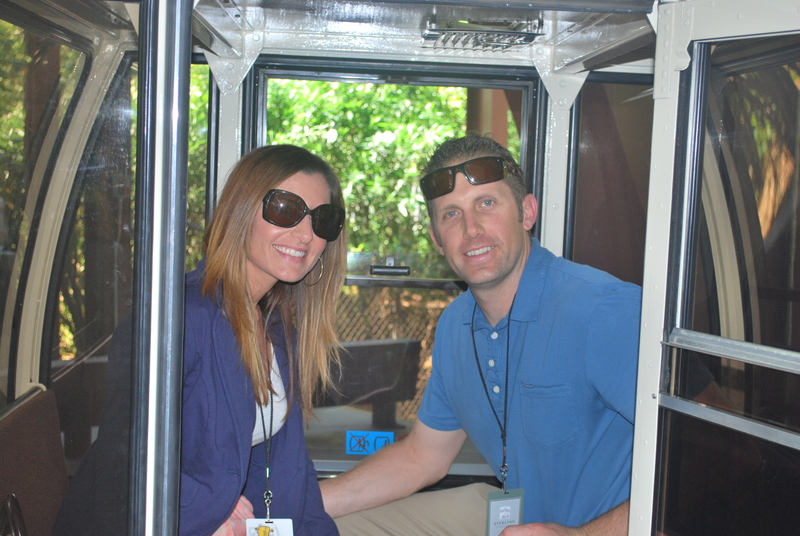 We had a small private tour and enjoyed a variety of different selections. They are known for their Sauvignon Blanc, which I’m not usually a fan of but this one was nice and crisp for a hot summer day. Their Merlot was also very nice and I highly recommend. 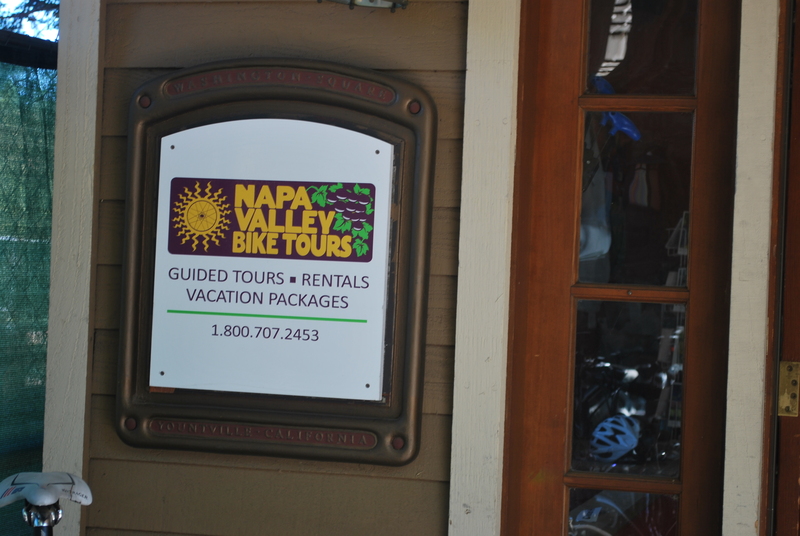 We purchased wines at both of these locations and the way the bike tour works is you just call their offices and let them know about your purchases and someone comes along after you and picks them up so they are back at the office when you complete your tour. No need to bring them along the route with you! After Cakebread we were starving so we headed up north to Rutherford Hill Winery but we were more looking forward to the lunch than the tastings at that point. 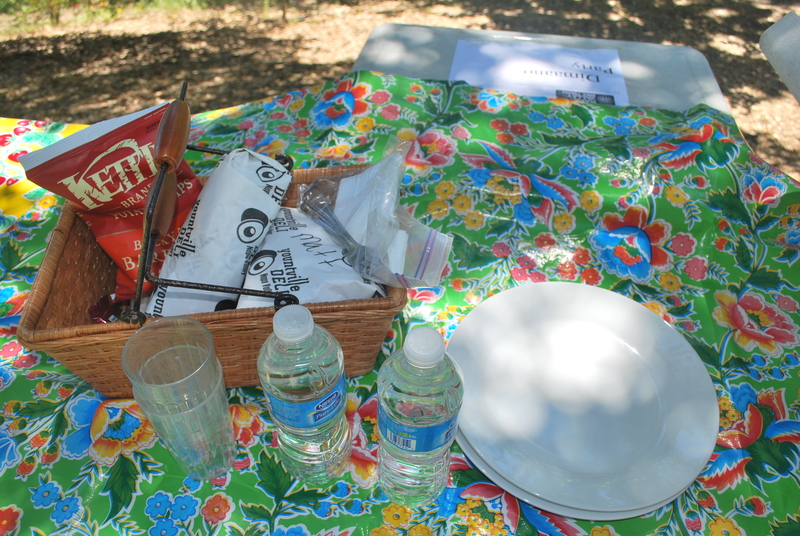 Once we got up the steep hill to the picnic area we arrived to a beautiful picnic inside of a ice chest with our name on it. Inside the ice chest was a table cloth, clean plates and silverware, napkins, fresh cool water with cups, 2 sandwiches, 2 sides, and 2 pieces of Ghirardelli chocolate. 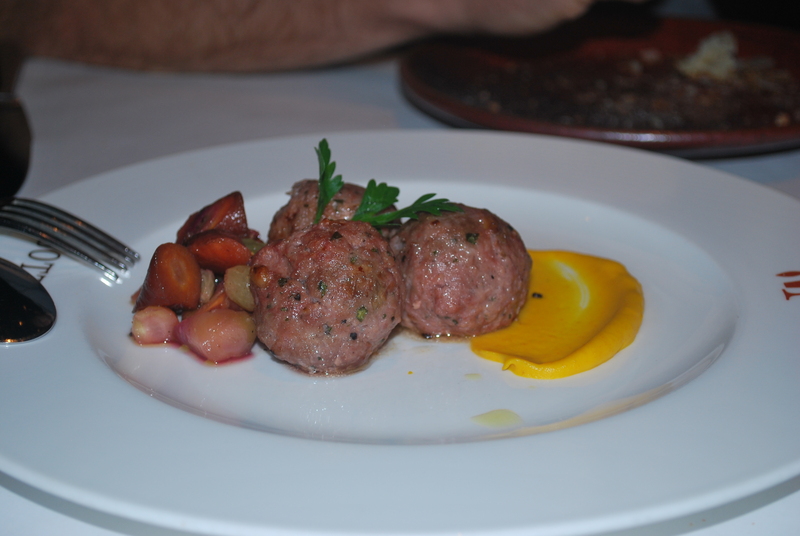 And the food was just as good as it looked! I had a vegetarian sandwich and Matt a turkey sandwich. The picnic area is open to anyone so I highly recommend it even if you don’t do the bike tour. We were so relaxed after lunch that we decided to skip the winery on site (Rutherford Hill Winery) and head straight to Mumm for some sparkling wine. The nice thing about the route was that after lunch it was mostly downhill, which was good because in the afternoon it got a lot warmer than it was in the morning. 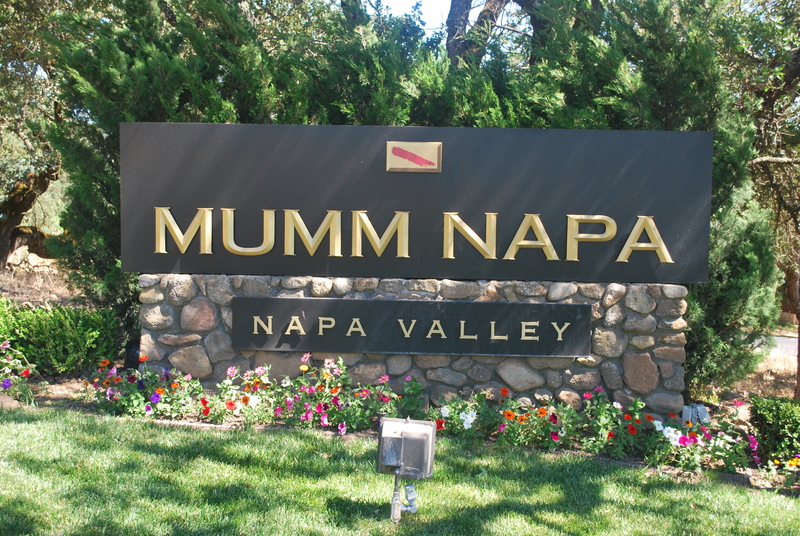 At Mumm we shared a sampler of their sparkling wines and really enjoyed a sparkling Pinot Noir that the host suggested pairs well with a Thanksgiving meal. We didn’t purchase any of these wines but I will definitely keep it in mind come November (unless I’m pregnant of course). We got back to the Bike shop around 430pm and of course we could barely walk. 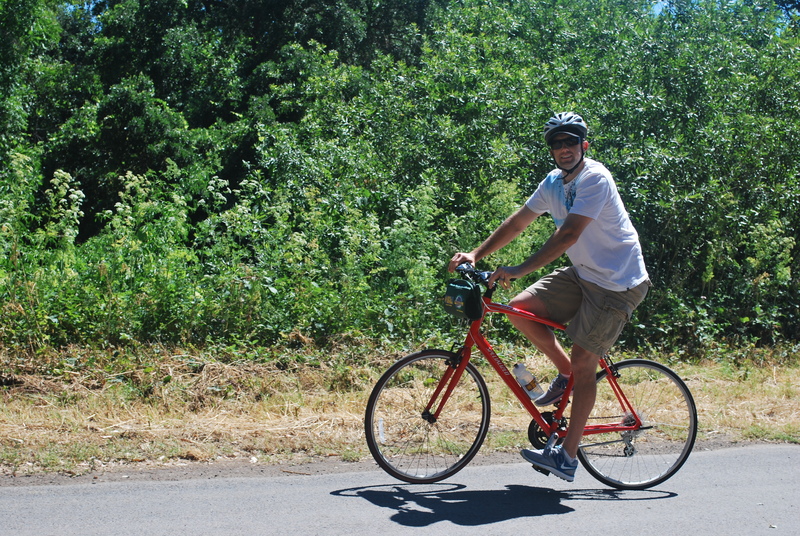 I guess that’s what 16 miles on a bike, heat, and wine will do to you, right? I forgot to mention, in the morning, before we got to the bike shop, I booked a couples massage for the afternoon at a place that was just 2 blocks from our hotel called St. Pierre Center for Massage. We definitely looked forward to this after our long day. We got back to the room, changed and walked over for our massages. The massages were just what we needed and both of us agreed we were no longer sore (as we were earlier from the bike ride). On the way back we stopped into the lobby for cocktail hour once again and then headed up to our room. 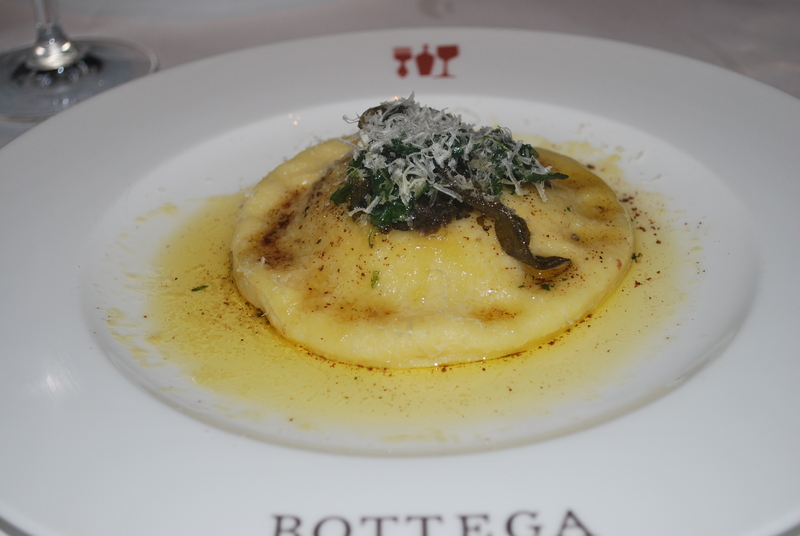 We quickly got ready for dinner and headed back north to our dinner spot – Bottega. This was probably the most crowded spot that we ate at during our trip. I ordered a glass of Pinot Noir, and Matt decided to pass since he felt he had enough for the day. We were served crusted bread with Parmesan, garlic butter before we ordered our food. 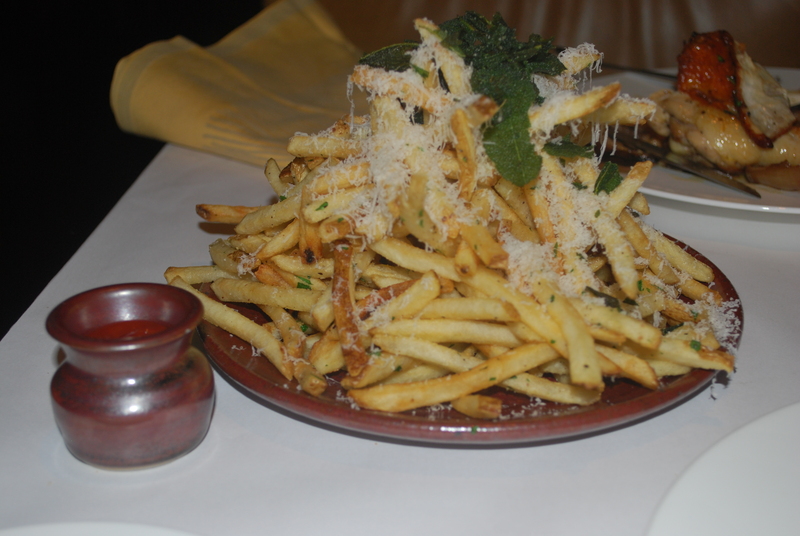 For a starter we ordered the beef meatballs, and for our entrees I enjoyed the Spinach Ravioli and Matt, the Marsala Chicken and truffle Parmesan fries. After dinner we drove back to our room and called it a night. The next morning we woke up and got ready to head home. 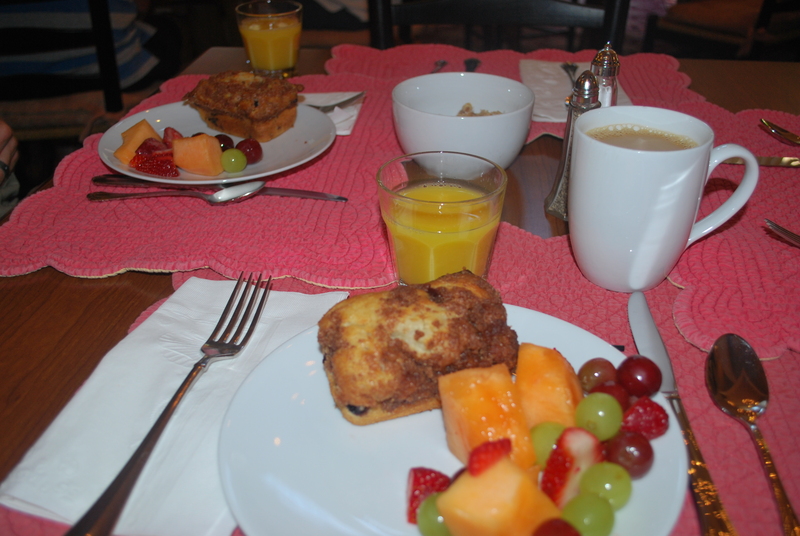 For breakfast the cook changed up the muffins and offered freshly baked blueberry coffeecake which was delicious, of course. We then packed our bags and headed home. It was about a 6 ½ hour drive home and we could not wait to see our baby. 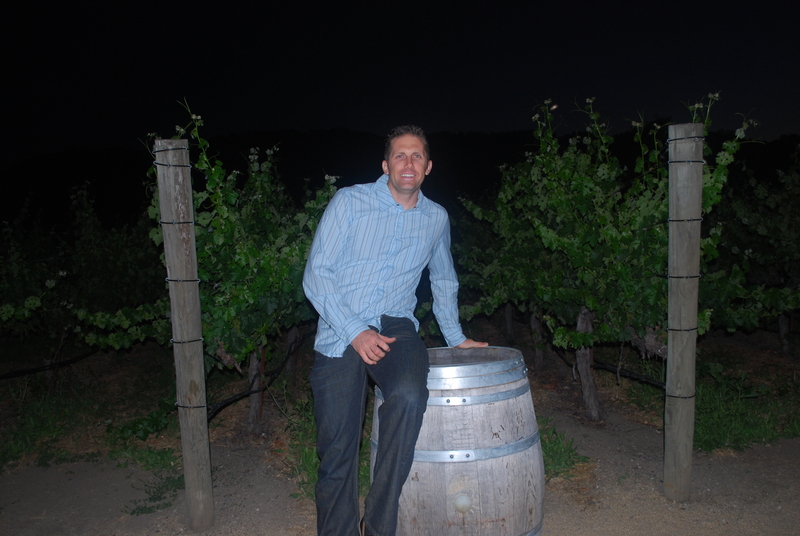 Overall it was an amazing trip but the 6 ½ hour ride home made me realize that Paso Robles is half that amount of time and the wine just as good. 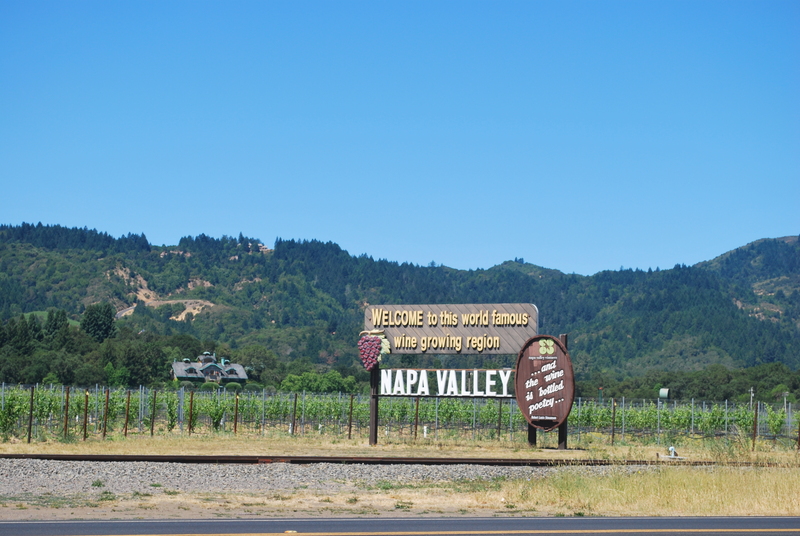 I’m glad we went to say we have been to Napa but I can’t imagine we’ll be going back anytime soon. 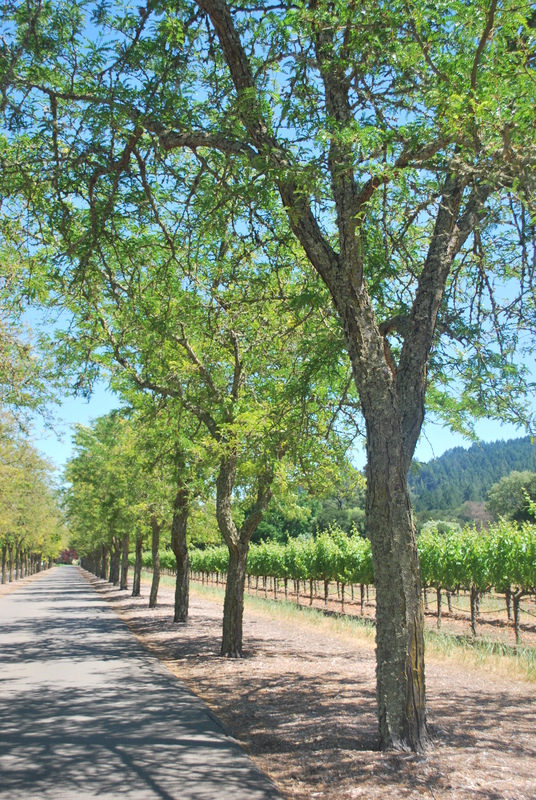 Napa is one of those places that everyone needs to visit once in their lifetime, especially if you already live in California. Please leave me comments if you have any questions about our trip! 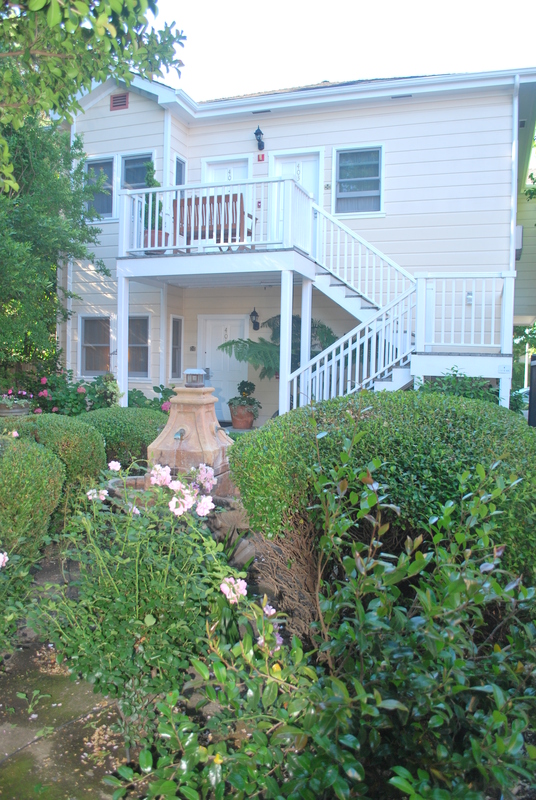 After lunch we headed up north a little further to San Luis Obispo (SLO) to visit our friends and stay overnight. 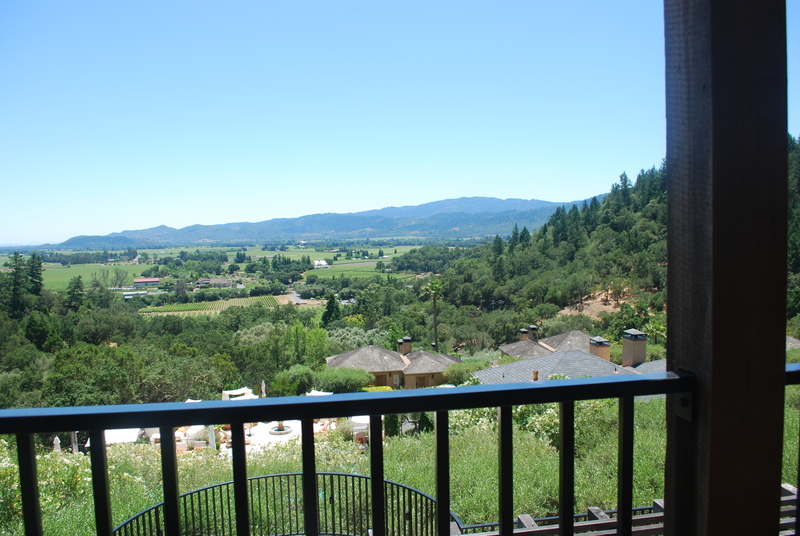 I understand its not ½ way to Napa, but we hadn’t seen our friends in months and they are expecting their 1st little one very soon so we wanted to make sure we visited while it was just us adults. We look forward to seeing them again as they become a family of 3. We also got lucky because on Thursdays SLO happens to have a big farmer’s market downtown, where we ran into another friend from high school soccer (who also happens to be pregnant). So many babies around was making me miss my own and I was definitely getting a little sad that mine wasn’t there for the trip up north. But I knew once we got to Napa it wasn’t going to be so family friendly. Friday morning we woke up early, said good-bye to our friends, and headed up north to Napa. It was about a 4 ½ hour drive to our first destination. 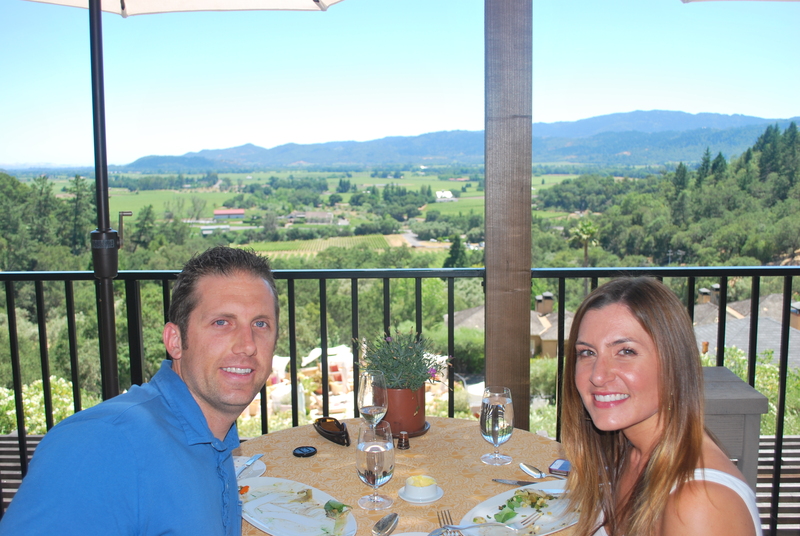 Our first destination on Friday was Auberge Du Soleil. 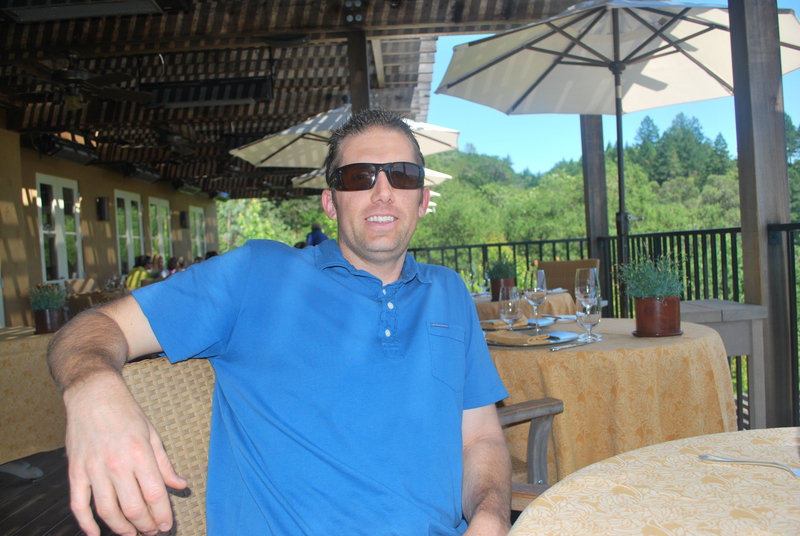 It’s a beautiful resort and restaurant in Rutherford (just outside of Napa) overlooking the vineyards. 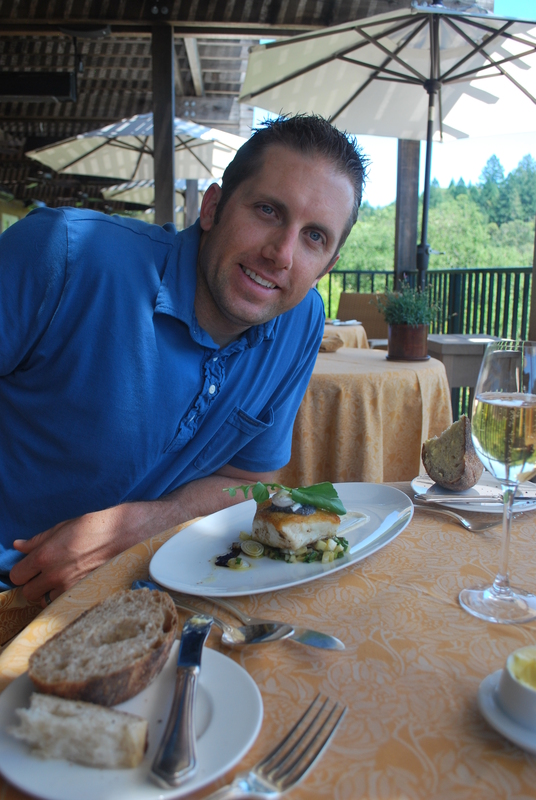 When I was doing my research I wanted our first meal to overlook the vineyards and enjoy sparkling wine and delicious food. 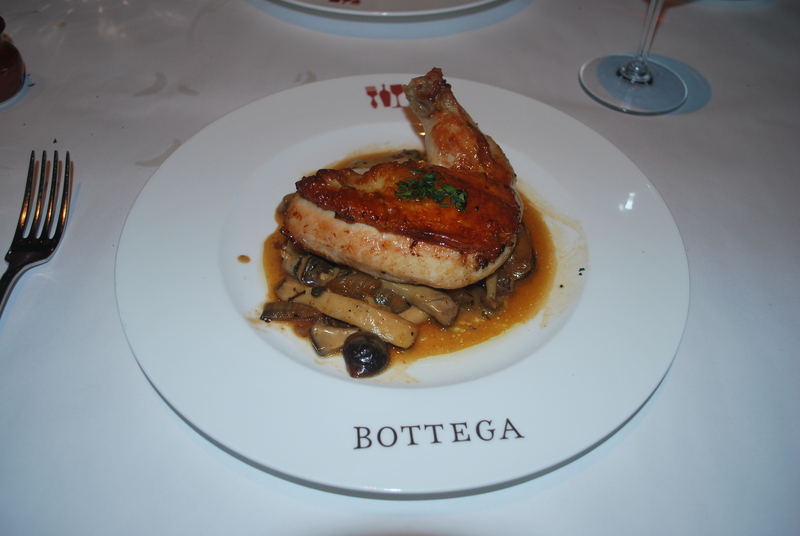 This restaurant was at the top of a lot of lists I researched and it definitely did not disappoint. Before our meal they served warm rosemary bread and creamy butter with sea salt on top. 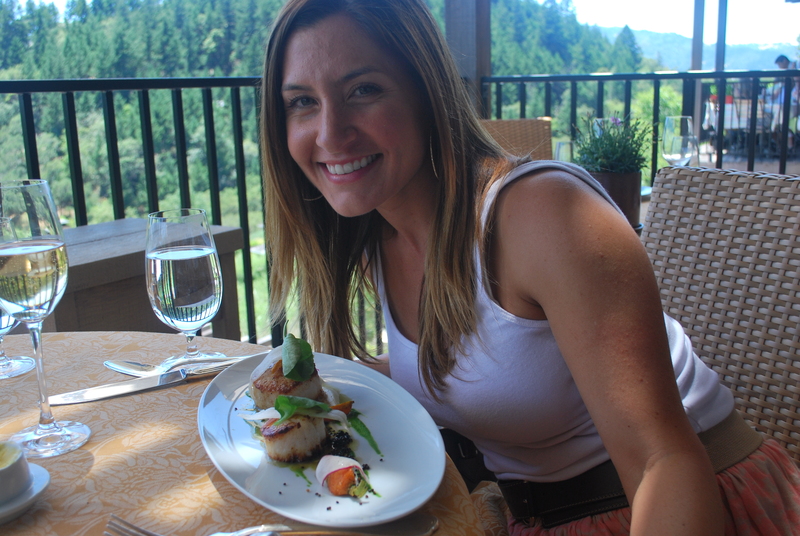 For our entrees, I enjoyed the scallops, my husband the halibut, and for dessert we had a strawberry tart. 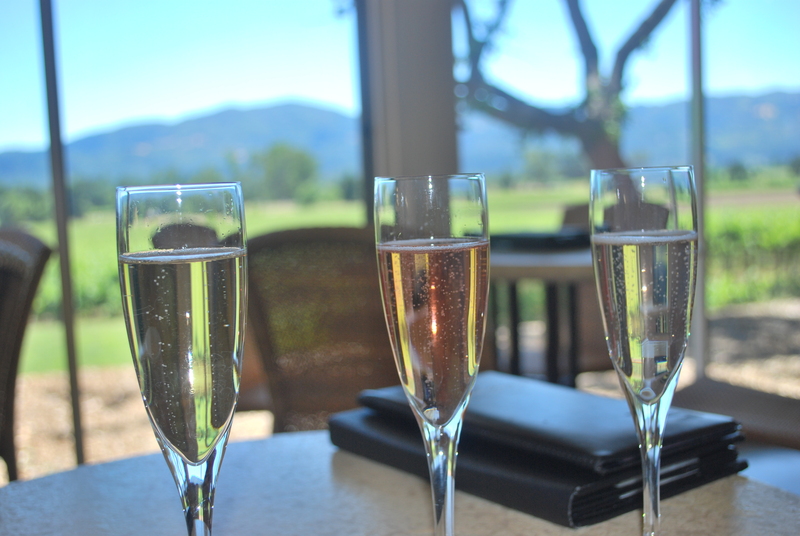 We also enjoyed their house sparkling wine which paired very well with the meal and the warm weather. Overall I’d give this restaurant an ‘A’ because of the food and most importantly because of the view. 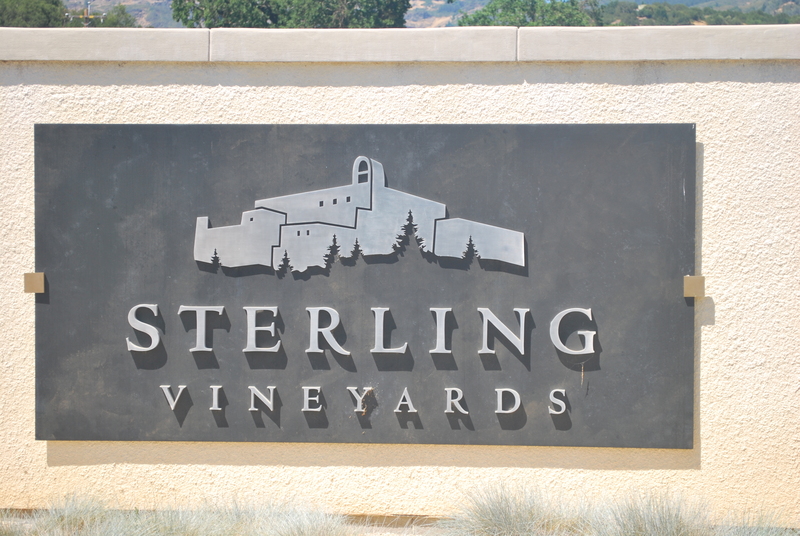 After lunch we headed to our second destination, Sterling Vineyards. 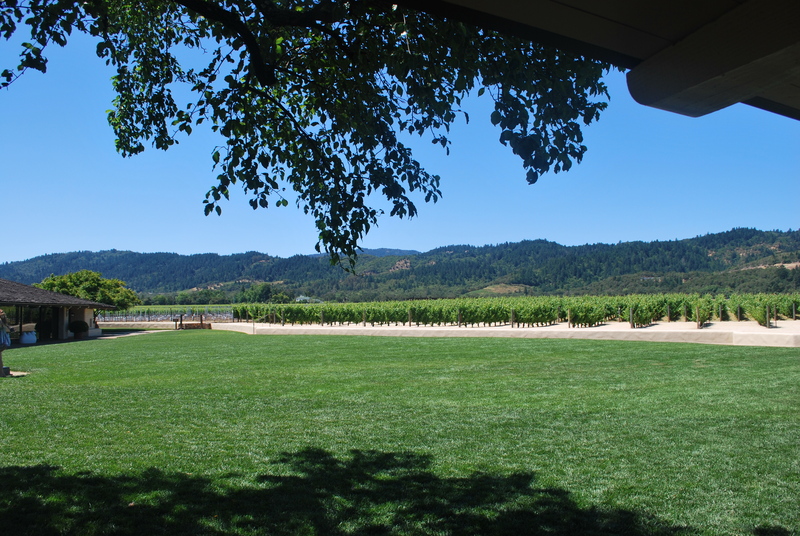 Sterling Vineyards is located in Calistoga, which is just north of our lunch destination in Napa Valley. Our friends recently got engaged there so we were looking forward to seeing the place in person for ourselves after hearing the stories. We each got the reserve tasting which was $35/person (after a $5 discount each). 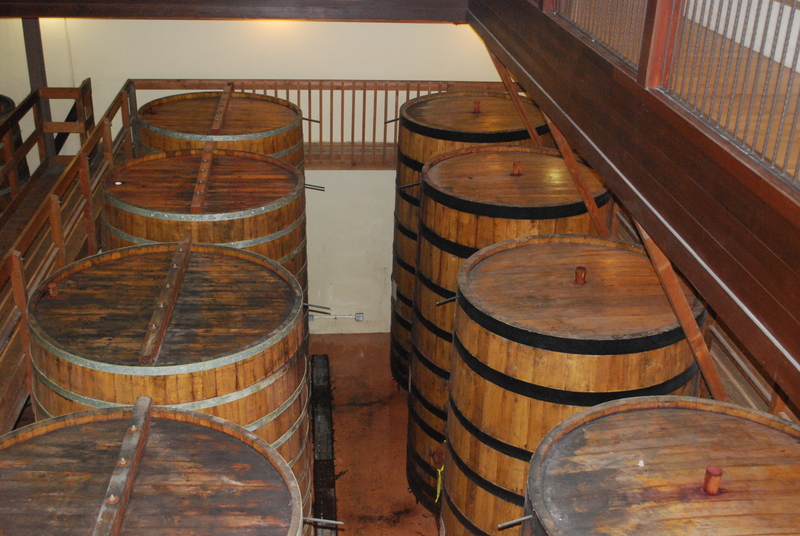 This included about 8 different varieties of wine, a souvenir wine glass, and a trip on the gondola which took you up to the winery itself. 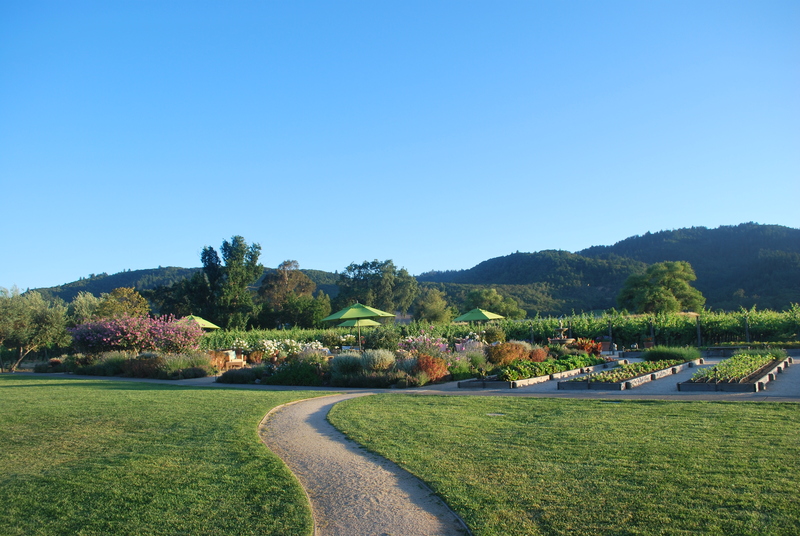 The grounds were beautiful and the self-tour offered a lot of history of the winery. Unfortunately, it appeared that some of the hosts pouring the wine didn’t seem to like their jobs or maybe they were just having a bad day and took it out on us guests. But by the end of the tour we had had enough wine and the hosts were much friendlier that I can say it was a good experience at the end of the day. Matt was still hungry after our petite sized lunch so we stopped at the Ox Public Market in downtown Napa to browse the food selections. He ordered a fancy chicken taco from a food stand and it looked delicious. 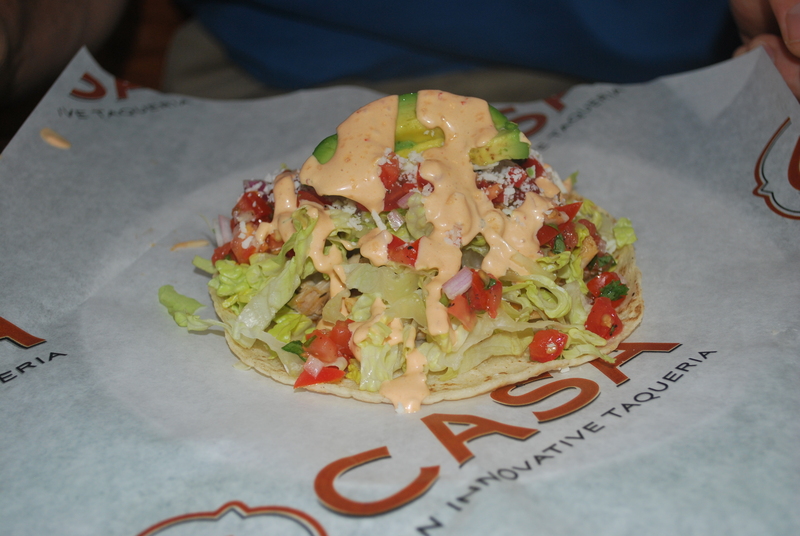 They had all these different varieties of tacos including fish, shellfish, beef, chicken…. 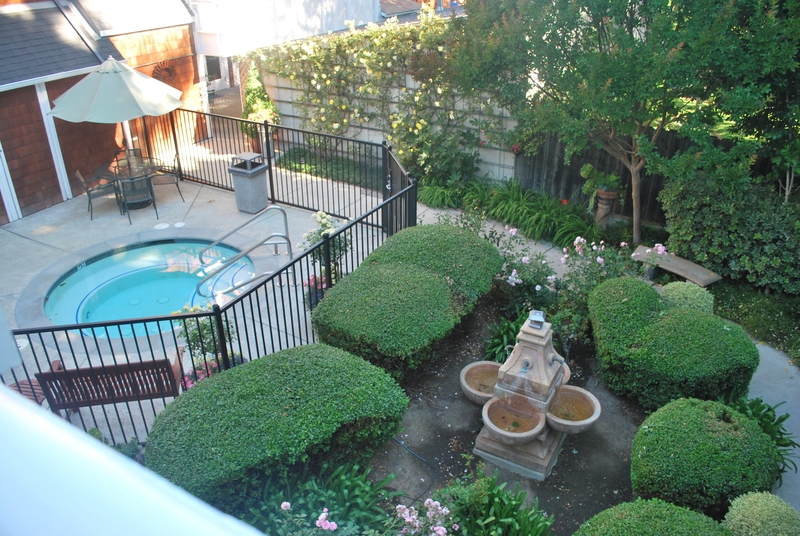 Now it was finally time to check-in to our hotel which was located south in the heart of Napa. 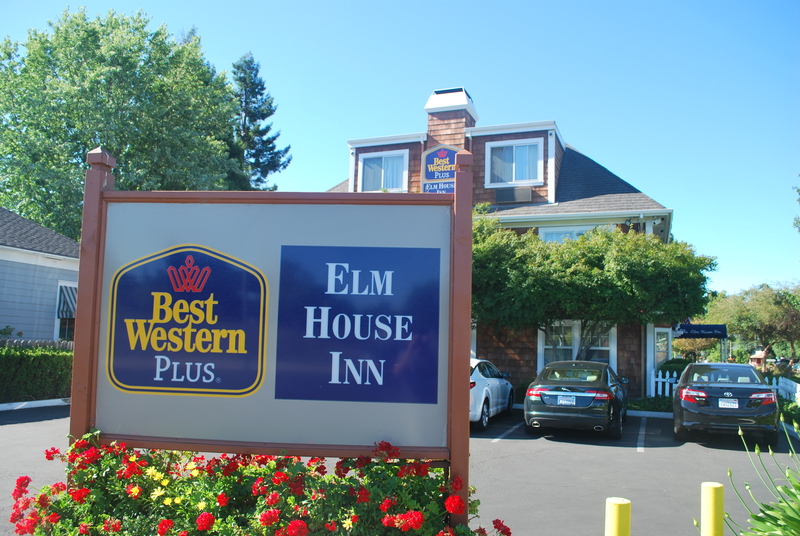 After hitting some afternoon traffic we made it to our place – Best Western Elm House Inn. Now you might be thinking, a Best Western? Really? 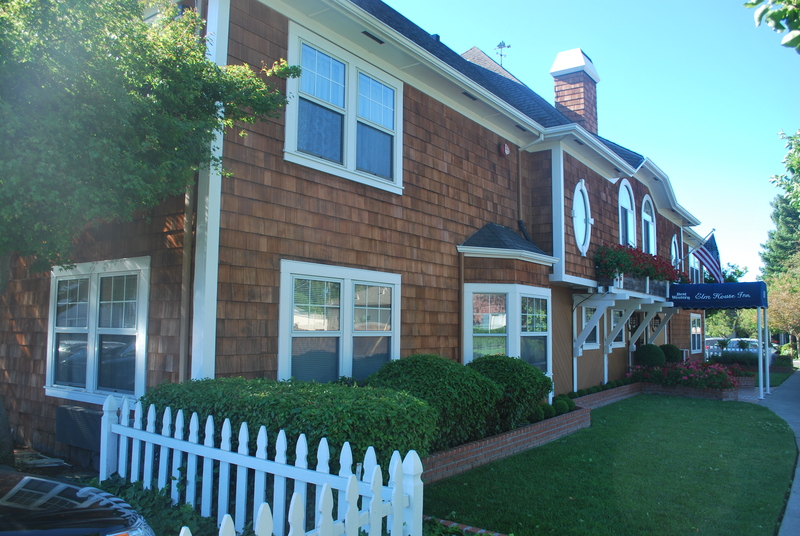 This is a unique place to stay because it is independently owned. So therefore it was basically a bed and breakfast. The owners and front desk hosts were so friendly and helpful throughout our stay. We were greeted with cocktail hour which included champagne, crackers and cheese, and the most amazing chocolate chip cookies. 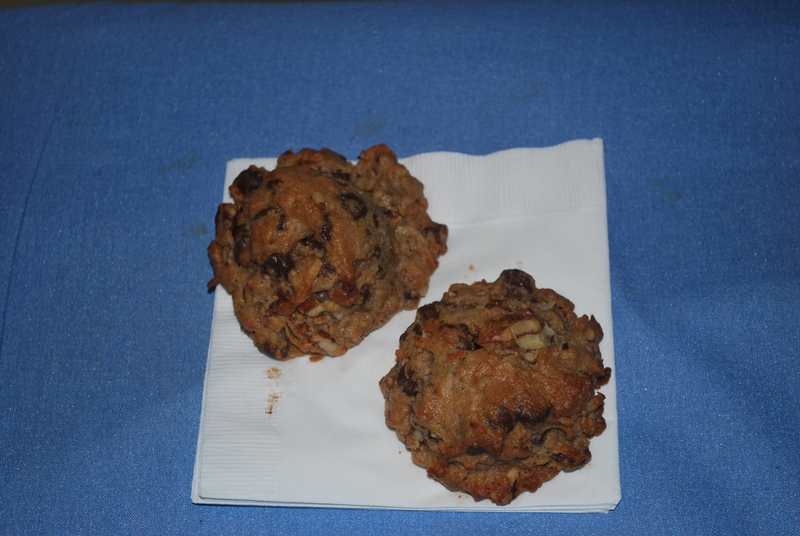 On a side note: My husband considers himself the expert when it comes to chocolate chip cookies (we even served them as our wedding favor at our wedding from a local cookie shoppe) and he said, and I quote, “these are the best chocolate chip cookies in the world.” I enjoyed some champagne and we headed to our room to rest for a few minutes and get ready for dinner that night. The room was very large; it even had a separate vanity for getting ready that was not in the same room as the shower and toilet. It also included a flat screen television, large chairs for sitting, desk, and overall it was very quiet. 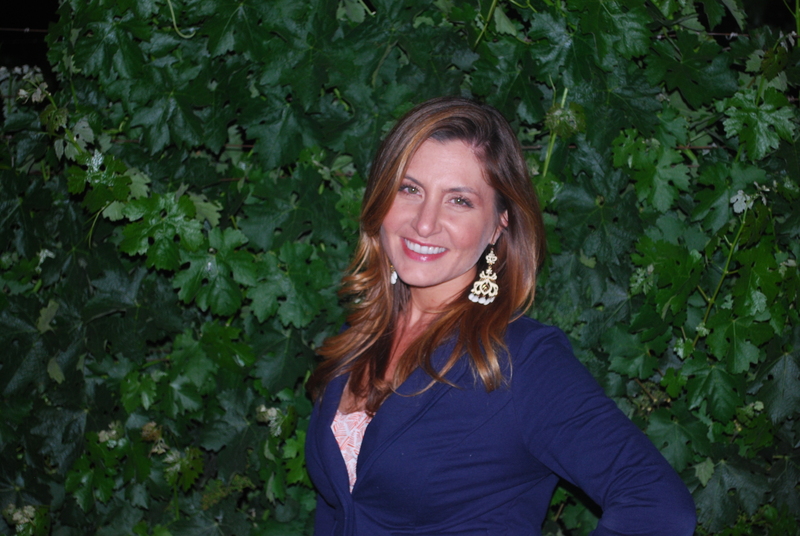 Dinner that evening was at a place called Brix located just north in Yountville. 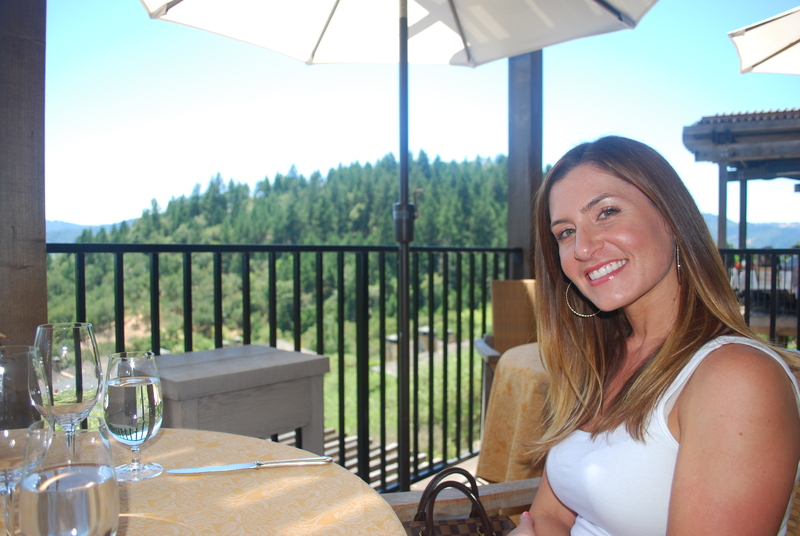 We were seated in the outside patio with a gorgeous view of the vineyards. We each ordered a glass of wine and were served rosemary bread with creamy butter and Hawaiian sea salt on top. 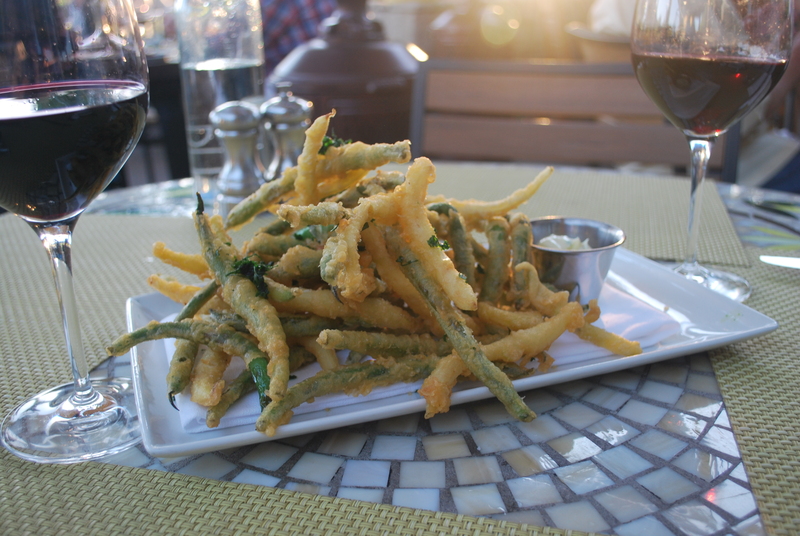 For a starter we ordered battered (green and yellow) beans with aioli dipping sauce. It was all just too delicious. For our entrees, Matt ordered the Filet and I ordered scallops again. 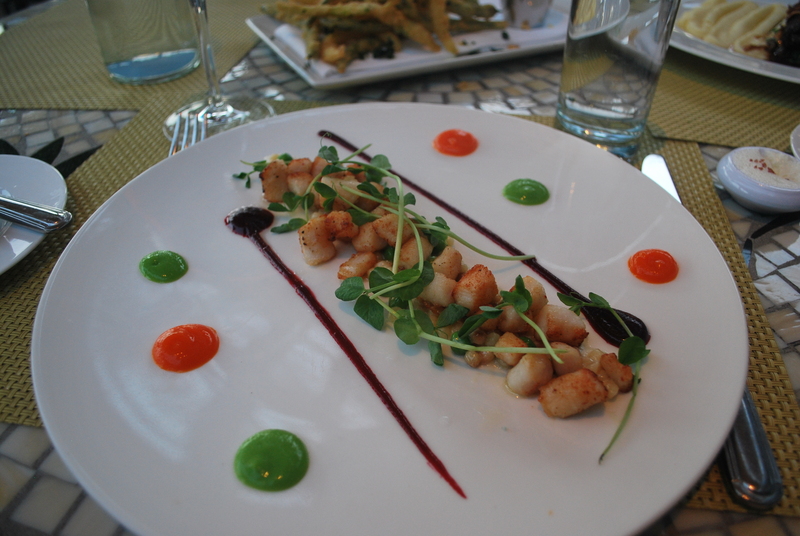 I just love scallops whenever I get the chance to order them. After dinner we walked around the garden and took a few photos. It seems like a lot of food but the portion sizes were always smaller than what we were used to at the typical ‘chain restaurants’ back at home. The price of course was also much higher than we were used to at home. 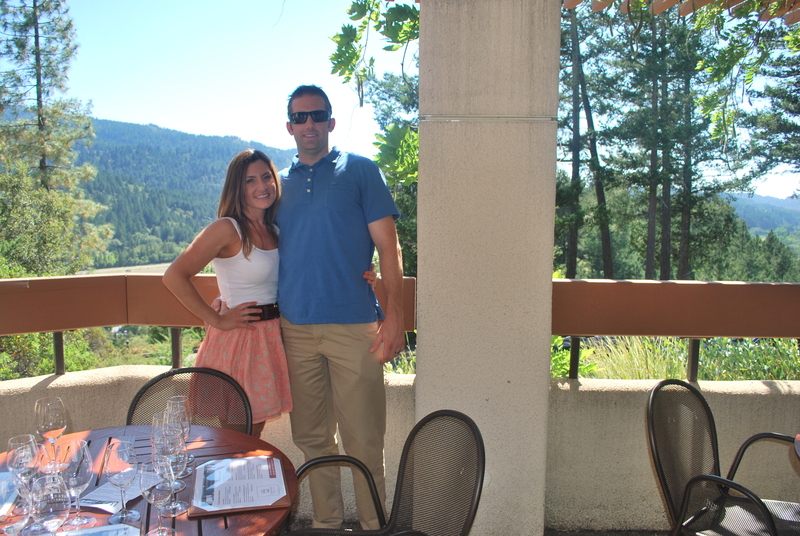 Overall I’d give this restaurant an ‘A’ and recommend if you are looking for a romantic dinner in Napa to check this one out. After dinner we came back to the hotel, changed into our bathing suits, and went down to the Jacuzzi. I can’t remember the last time I enjoyed a hot tub, and since I plan on getting pregnant soon, I probably won’t get to enjoy one again for at least another year. At the hot tub we chatted with a few other guests and they all agreed that they found this hotel through Trip Advisor (it was ranked #1 in case you wanted to know). 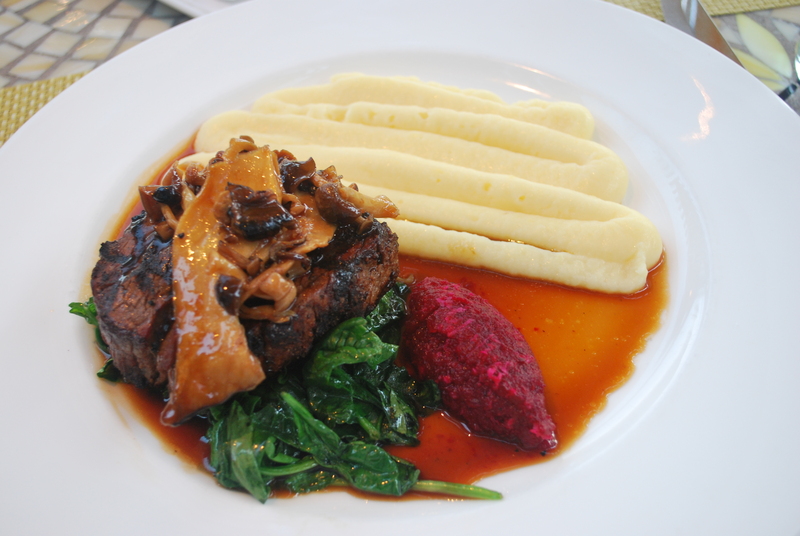 They also shared a few tips that they had researched for restaurants and wineries. One that I really liked was the ‘Winery Finder Application’. 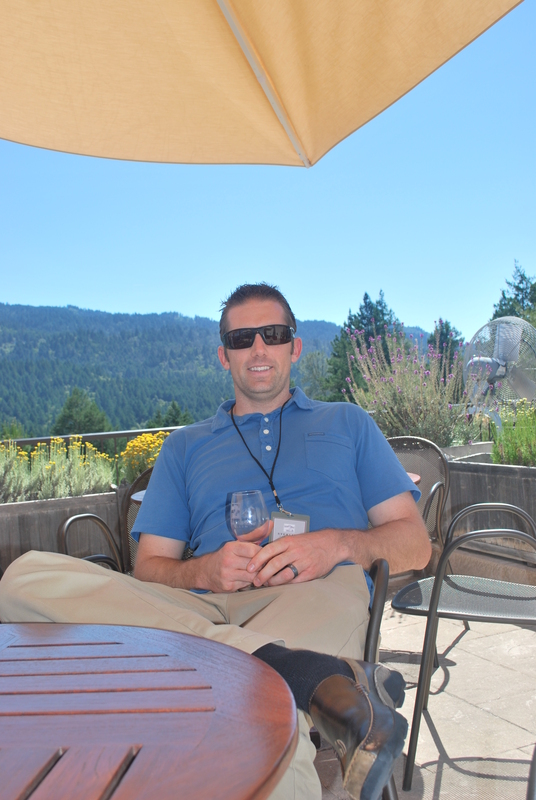 We were able to get 2 for 1 tastings at almost all the wineries we visited using this application. 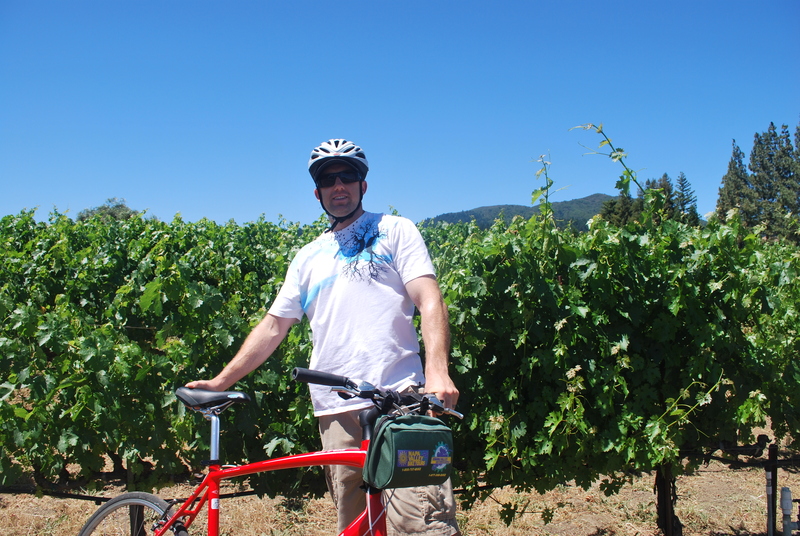 It also helped me pick our wine tasting ‘route’ for the next day’s adventure – Napa Bike Tour.